Conversation hearts message magnets come in a set of four. 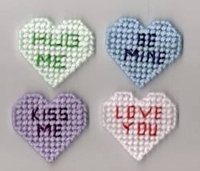 These plastic canvas hearts would be great to hang messages to use when leaving messages for your loved one. Be Mine, Love You, Kiss Me and Hug Me. Each heart is approx 2" and are stitch in pastel colors. These are great for anytime of the year.